One of my favourite films of all time is Julie & Julia, the story of how Julie Powell was inspired by Julia Child to cook her way through Mastering the Art of French Cooking, and transform her life. Right after I saw the film, I fell in love with cooking too, and purchased my own copies of Mastering The Art. I spent the summer after graduating high school learning to make a roux, béchamel sauce from scratch, and many, many cakes. But only six months later, in the middle of my first year at university in London, I decided to adopt a plant-based diet. It was back to the drawing board for me, and my copies of Mastering the Art of French Cooking have remained untouched on my cookbook shelf since then. I taught myself plant-based booking through a mix of intuition and recipes found online. Then I was approached by Viva Editions about Veganish: The Omnivore’s Guide To Plant-Based Cooking. I was hesitant at first: I blog mostly about vegan dessert recipes, and to be honest, I wasn’t sure that this book was ground-breaking in any sense. But you know what? It’s pleasantly surprising to be proven wrong sometimes. My meals lately had been so boring, and after long days at work I often rely on ready-made soups and curries. Being vegan, they’re not so unhealthy, but still not nearly as healthy as homemade food. So I made a commitment to cook from Veganish for a week, and I have never eaten so well! 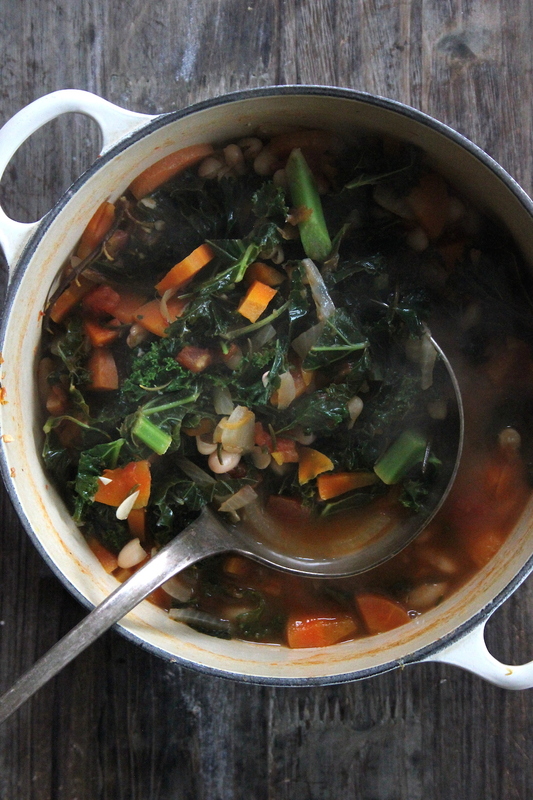 I shared the White Bean and Kale Soup with an omnivore friend of mine, who said it was probably the healthiest thing she’d ever eaten. 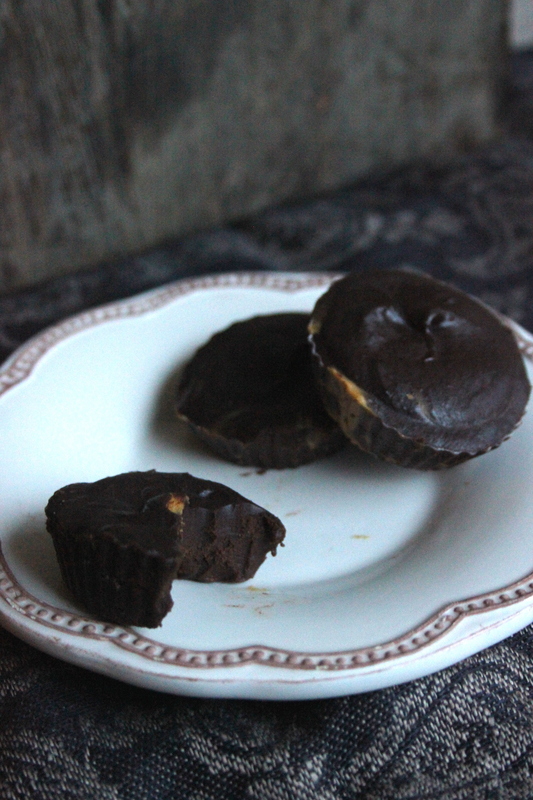 There is a recipe for chocolate ganache in Veganish which I adapted to make these little peanut butter chocolate ganache cups. This stuff is so irresistible it should be illegal. Seriously. I should have doubled the recipe. 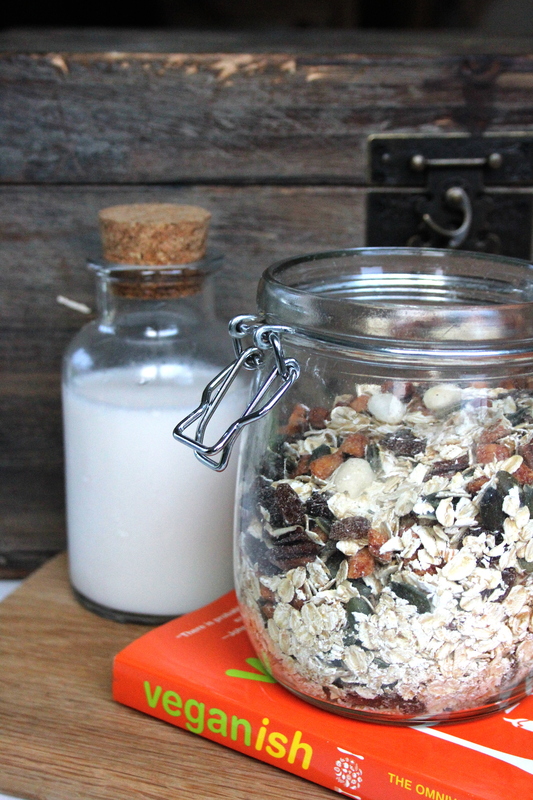 I also had to make the recipe for Viking muesli — a seriously plant-powered breakfast! I made it warm since the days are so cold now in Scotland, but this would make a light summery breakfast if chilled. If you’ve been following me on Instagram, you will have seen me posting about the Roasted Root Medley — a new staple recipe in my diet! 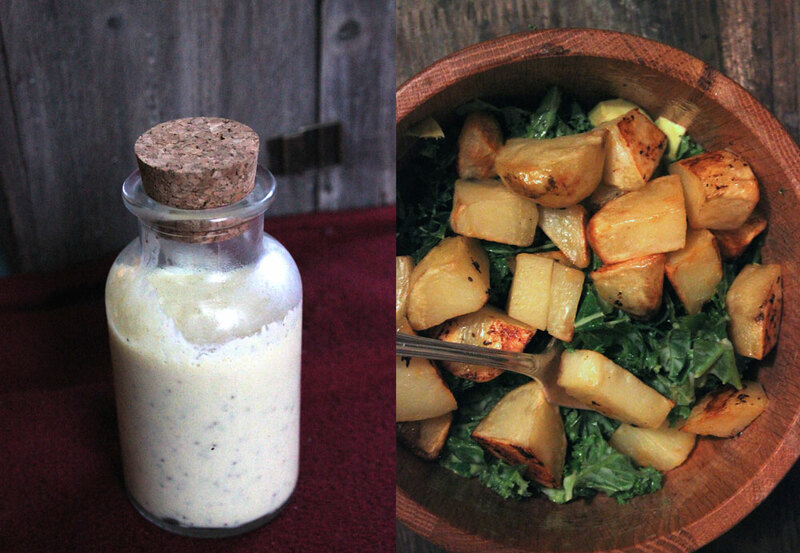 I have been pairing it with kale salad marinated in the ‘Honey’ Mustard Vinaigrette, my new favourite salad dressing. I’ve never been good at making salad dressings, but Mielle’s recipes have changed that. You’ll notice the title says ‘plant-based’, not ‘vegan’. Mielle Chenier-Cowan Rose has been a vegan chef and advocate for natural living for over 15 years, she studied healing foods and culinary nutrition at Bauman College and has worked with some of the most prominent vegetarian restaurants in the San Francisco Bay Area, including the raw food restaurant phenomenon Cafe Gratitude. But her family has suffered from health issues that left her with no option but to reintroduce animal-based products into their diets. What I like about Mielle’s book is that it encourages an attitude of compassion and flexibility, while emphasising the benefits of a plant-based diet. ‘You will be fine,’ she says, ‘if you relax, follow your intuition, and pay attention to recommendations that resonate with you, and eat a wide variety of seasonal whole foods with joy and gratitude.’ Veganish contains recommendations like ‘buy ingredients that you recognise from nature and cook your meals from scratch as often as possible’; ‘make an effort to avoid unnaturally altered, refined ingredients’; ‘be moderate, balanced, and flexible.’ For someone who has suffered from a disordered relationship with food, this book is heaven-sent. Reading this book, I never once felt pressured, belittled or misunderstood. The one downside? No pictures. Ach, for a cookbook collector such as myself, that was a shock at first — but as Mielle says, she doesn’t want this to be a recipe book, she wants it to be a cookbook. One that you can use as a staple, a guide to learn the basics from and use to build up your confidence as a plant-based cook. So, pictures really aren’t all that important. On the other hand, Veganish includes concise but highly informative chapters on plant-based nutrition, salt, cooking oils, cooking methods and special techniques. These 217 pages are jam-packed with comprehensible information and delicious recipes. I consider Veganish to be the modern equivalent of Julia Child’s books, and a very important book for our time. Veganish is published by Viva Editions and is now available on Amazon and Barnes & Noble. All in all, I definitely recommend this book. It’s the perfect gift to someone who is just embarking on a plant-based cooking, or wants to learn to cook in a balanced, intuitive and wholesome way. The recipes are simple, the information makes sense, and the food is scrumptious. 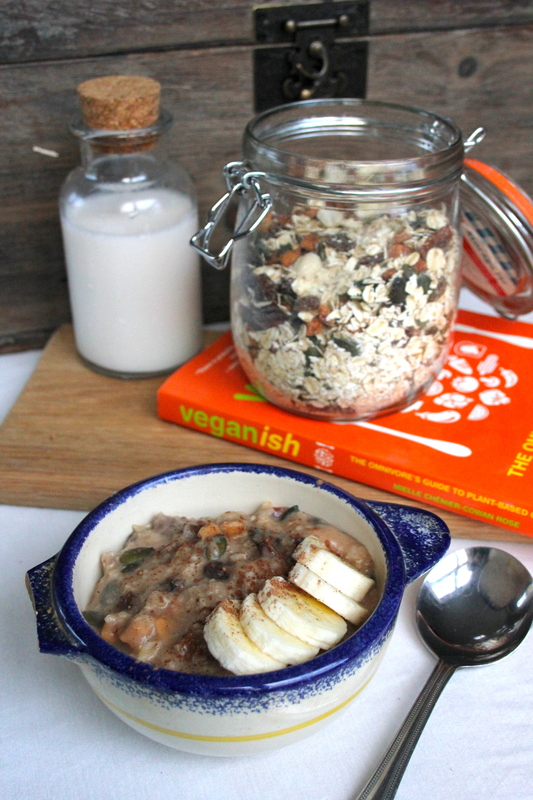 Have you read Veganish, and cooked any recipes from it? What’s your definition of a balanced plant-based diet? Disclaimer: Viva Editions sent me a copy of Veganish for reviewing purposes, but as always, all opinions here are my own, and I mean every word I say. Interesting posts — but Veganish, as well as other books, is also ab\vailable at INDEPENDENT BOOKSTORES — the ones that will sustain the communities that give us farmers’ markets, small specialty restaurants, and more! I never said it wasn’t. It is easier to link to Amazon than indie bookstores, though, especially if they don’t have an online shop. And I would have to link to thousands of them. I did do a degree in Publishing and I know how this industry works, I love indie bookshops with all my heart. If you follow me on Twitter, Instagram and Facebook you will often see me mention indie sellers and manufacturers. That being said, it is people like you and me who work for the big companies, and they need to earn their bread too.